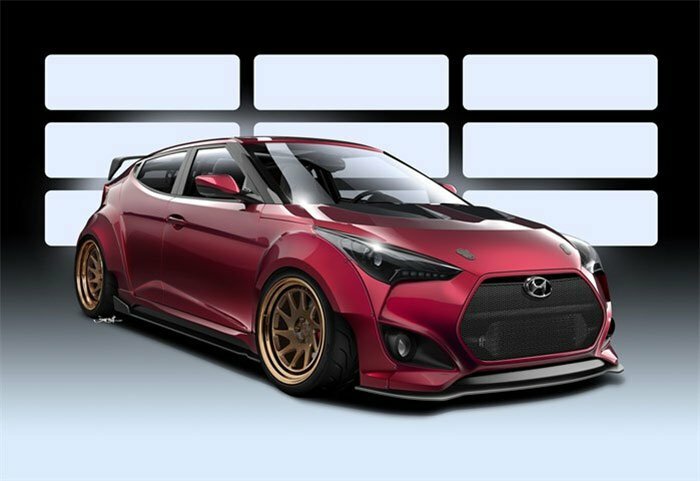 Hyundai has teamed up with Gurnade to bring a very cool and customized Veloster to SEMA this year. The car is called the Gurnade Veloster Concept. The car isn’t focused on making insane amounts of power and gets by with modest engine upgrades. These upgrades consist of a new ECU tune, cold air intake, and upgraded intercooler and downpipe. The car also has an ARK Performance catback exhaust. Rather than raw power, this concept is more focused on being able to perform on a racetrack .This means handling and aerodynamics were most of the focus for this build. The car has 6-piston big brake kit, NEO motorsports coil-overs, 19-inch 3-piece alloy wheels, and Toyo competition tires. The car is coated in a special Magic Magenta paint and has custom fender flares, canards, side sills, front splitter, and a custom rear spoiler. Inside the car has racing seats and harnesses, custom gauges, and a custom stereo system.